Join TSJ for this special screening of the award-winning documentary Louder Than a Bomb, a film about passion, competition, teamwork, and trust. It's about the joy of being young, and the pain of growing up. It's about speaking out, making noise, and finding your voice. It also just happens to be about poetry. A panel with filmmakers Jon Siskel and Greg Jacobs and Kevin Coval, co-founder of the youth poetry festival Louder Than a Bomb, will follow the screening. Plus, LTAB poets will grace us with a performance. Update: Tickets are no longer available and registration has been closed. Keep an eye out for another screening in the new year! Lean more about the event. *Pre-Registration Online is Closed. Feel free to register in person! OPENING PROGRAM: (10am-noon) Always diverse, poignant, and inspiring, take a peek at this year's 2010 Opening Program Keynote Speakers & Performers. CURRICULUM FAIR: (all day) K-12 Teachers will be on hand at the Curriculum Fair with poster-board visuals to discuss their favorite curriculum. Check out the Full List of 2010 Curriculum Exhibitor Topics. 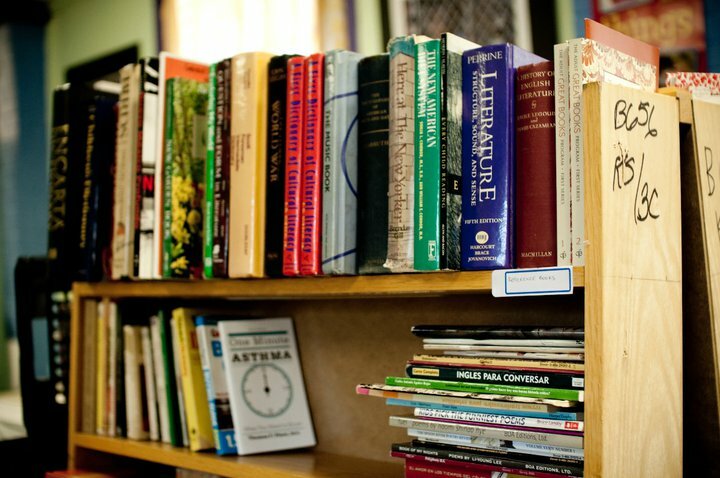 RESOURCE TABLES: (all day) Local & national organizations will have tables to share relevant resources & books. Check out the full list of 2010 Resource Tables. WORKSHOPS: (2 Sessions, beginning at noon) Community leaders will be facilitating dialogue through a number of workshops on vital educational & justice-related issues. Check out descriptions for the 14 2010 Workshops. LUNCH: Lunch is provided for all, to sustain us as we move through our day. Donations from local restaurants and chefs will provide us with various options, including vegetarian & vegan. EXHIBIT & INTERACTIVE ARTS. Movement artists will be on hand to inspire & amaze through social justice-themed paintings & banners, and will be inviting you to create with them. CHILDCARE: We'll be offering childcare from 10am-5pm with thanks to the Chicago Childcare Collective. Registration through Online Registration. HEALING SPACE: TSJ is collaborating with Sage Community Health Collective to provide a Healing Space for fair goers. There will be session signups for massage and acupuncture, as well as an ongoing quiet place where all you hardworking teachers can get away from the day's stress & relax. TRANSLATION: For the first time, we've committed to expanding language access at the fair to spanish speakers. The opening program will be translated simultaneously and workshops will include translators upon request. TSJ GEAR: One of our favorite things to do in prep for the fair is to get teachers together and create our own art. This year we've got some hot new t-shirt, totebag & button designs- come by the TSJ table to pick up yours! Performance Artist Una Aya Osato (NYC) & excerpts from "Recess"
Update: Our Setup/Cleanup committee has committed to recycling paper & plastic this year and TSJ is striving to have a plastic-water bottle free event. Please bring a bottle of your own. Update: We have also committed to having gender-neutral bathrooms, which will be clearly marked at the fair. Update: Please support La Casita Community Library - Bring a Spanish-language children's book (3rd - 7th grade level most needed) to donate! Drop them by the La Casita Young Librarian's table where Whittier students will update you on their struggle for a library and community space. We hope you'll help us shape this space to be accessible for people with disabilities, accommodating to those with language & dietary needs, and safe for all people to be their full selves. A note on registration: we missed emails from Online Registrants before Nov. 2. If you registered online before then, we most likely have your info and can send you the program if you drop us your email. Either way, there is plenty of space and we'll look forward to seeing you on Saturday. There is no registration cost, though we request a $5-10 donation (includes lunch) if you can give. This is an all-volunteer event and all volunteering, monetary donation & in-kind support is appreciated so we can cover costs. The Childcare Space & Healing Space will accept tips as well. Thanks! Following on the US Social Forum in Detroit in June, the national upswing in education organizing, the victory in Milwaukee against Mayoral takeover of their public schools, and the recent tremendous victory by CORE for Chicago Teachers Union leadership, we recognize the need more than ever to build the momentum of the Education for Liberation movement. 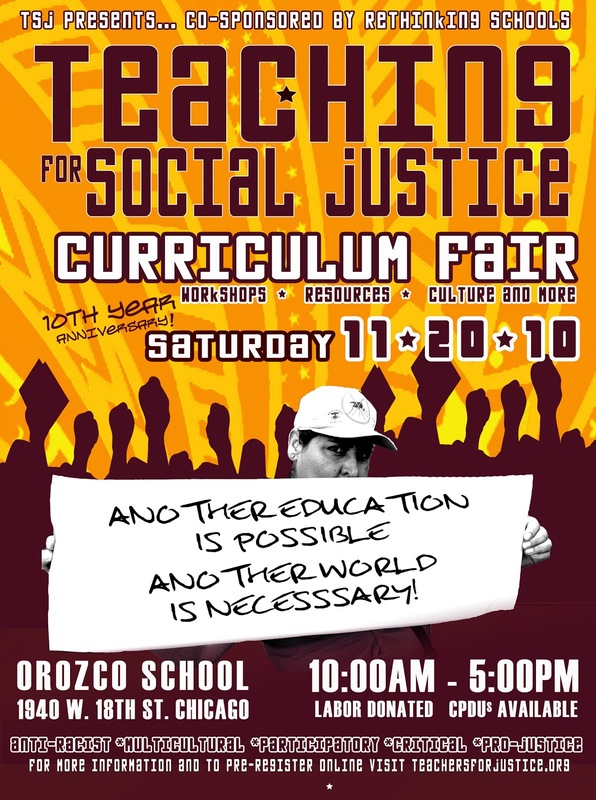 For 10 formative years of the Curriculum Fair, we have come together based on our commitment to education for social justice. Along with educators countrywide, we are working toward classrooms and schools that are anti-racist, multicultural / multilingual, and grounded in the experiences of our students. We believe Another Education is Possible and understand that we must take on discussions of school policy in order to create more just and humane schools, but we're also connected to a national & international network of educator activists and recognize together more and more that Another World is Necessary. 1] Cantastoria: Creatively Telling Our Stories. Room 210. Using the art form cantastoria three art educators will perform visual storytellings and reveal the poetic and playful nature of this ancient art form as a method of social critique. The tradition of cantastoria originated in India as way to use visual paintings, with song and story, to communicate a social message of importance. The historical traditions of cantastoria make it a perfect medium for lecturing, critiquing, and conveying complex information in a creative format. 2] Towards a Social-Justice Oriented Chicago Teacher’s Union. Room 214. With Teachers’ Unions under attack nationwide, how can Unions survive against the onslaught of negative media from outside and negative perceptions from a new generation of teachers? Teacher’s Beyond an agenda of the “bread and butter” issues of teachers, unions can be a democratizing and social justice force for students and communities. Large emphasis will be placed on changes within the Chicago Teachers’ Union. 3] Don’t Just Talk About it, Be About It: Social Justice & Action in the US History Classroom. Room 211. We will be presenting a Freirean perspective about what it means to teach for social justice in the US history classroom. This perspective radically differs from traditional history classrooms and differs significantly from most “liberal” and “progressive” history classrooms. Our contention is that the US history classroom must make its primary focus the conditions of oppression faced by our students, and also must build in action by students to transform that oppression. 4] NOT Waiting for Superman: The Money Behind the Movie and What We Should Do About It. Room 200. This workshop will start with a presentation and group discussion on the money and ideology behind the movie “Waiting for ‘Superman.’” The second part of the workshop will examine the organized response to the movie and the strategic implications this movie has for progressive educators and teacher union activists. 5] Chain of Change: Mobile Media Youth Responses to Violence. Room 212. Chain of Change, a Beyondmedia Education initiative, organizes youth across community boundaries to create and broadcast media that expose the roots of violence. ChainofChange.com is a forum for youth-led discussion on the many forms of violence youth face, from relationship violence and street harassment to institutional and media violence. Through story sharing and hands-on activities, participants in this workshop will learn how to create and use mobile media devices, such as Flip cameras and cell phones, for preventative and curative anti-violence activism. 6] Leaving No ELL Behind When it Comes to Comprehension. Room 202. “I don’t get it”… “Huh?”… “Qué?” If you find yourself hearing these all too familiar, reoccurring phrases from your students, this workshop is for you. Our ELL students may have learned to read, they may even be fluent readers, but it’s time we teach them how to read for meaning. Learn how to scaffold your reading comprehension instruction utilizing the language domains and proficiencies of your students with culturally relevant picture books. 7] Start Building Supportive LGBTQ Educational Spaces. Room 213. Join us in exploring the impact that allies have in your own life. Connect these experiences to the importance of allies in the LGBTQA community in educational spaces. Through interactive activities we will learn how to use these ally characteristics in real life situations. 1] Organizing for Radical Educational Transformation in Chicago, in a post-Daley era. Room 211. Public education is under attack on many fronts. Where are these attacks coming from and why are they occurring? How can teachers, parents, students, community and education allies UNITE to demand a voice in education and school improvement issues? This workshop will emphasize the many educational transformation efforts that are occurring and engage participants to strategize on what else can be done to defend and strengthen Public Education. 2] Teaching through Lies: Ideological Literacy and Popular Culture. Room 212. This workshop will provide teachers with classroom strategies to help their students analyze the ideological structure through which ideas of race, class and gender are constructed in the media generally, and in corporate rap music specifically. Drawing on critical perspectives for a teaching framework, this workshop offers curricular examples for preparing students to examine issues of privilege, social control, and oppression in U.S. society while fostering their intellectual analysis, academic aptitude and creative writing and voice. 3] Urban Renewal or Urban Removal? Draft Curriculum Release and Practical Applications for Educators, Activists, and Community Members. Room 200. 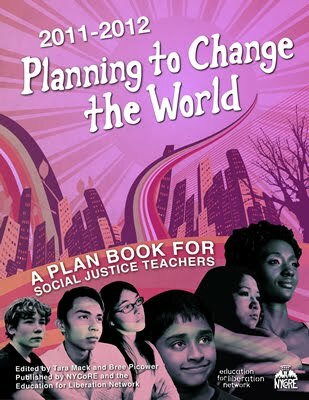 4] Empowering Parents for a Social Justice Classroom. Room 214. This workshop focuses on the importance of including parents and community members in a social justice classroom. Currently, the disconnection between community and schools is thriving under policies in urban schools that uproot students from their communities. Logan Square parents recognize the need for school-family relationships and took it upon themselves not only to invite but to encourage parents to be an authentic part of the classroom. This workshop will highlight the barriers to parent participation and invite participants to brainstorm strategies that effectively use the assets of the community in a social justice-based classroom. 5] Using Spoken Word in the Classroom. Room 213. Using Spoken Word in the classroom- Tim Stafford is the editor of the anthology Learn Then Burn and co-authored its Teachers Edition. 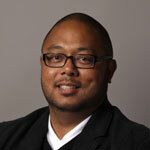 He is also a poet and Chicago Public Schools Teacher. In this workshop Tim will show you how to use spoken word as well as your own writing to teach poetry in a way that is both productive and engaging. 6] Introduction to the Occupation in Palestine/ Israel. Room 202. This workshop gives high-school students and teachers an overview of the Palestinian-Israeli conflict leading to current Israeli occupation of Palestine, and the political struggles and everyday realities that are part of the occupation. The workshop uses media including maps and music videos to dissect the historical context of the occupation and break down Zionism, as well as relate the situation in that part of the world to displacement, eviction, brutality, and resistance that may look familiar to Chicago students. Students and teachers are welcome and will receive a workshop outline and resource list for those wanting to replicate the workshop. 7] Roots Of Violence- Heterosexism. Room 210. This training is designed so that trainees will be able to understand the ways in which everyone is impacted by systemic violence based on sexual orientation and gender-identity, as well as the ways that it is connected to other forms of systemic violence such as white supremacy and imperialism. The goal is to develop a shared recognition of systematic violence based on sexual orientation and gender-identities. 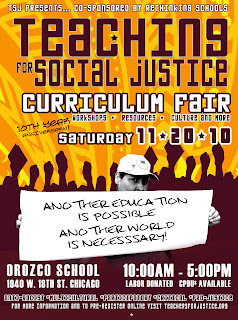 A list of this year's social justice curriculum exhibitors! Teachers who developed these curricula will be on hand with visuals & resources.